spoken, and saw clearly before him the Son of God. The mind of Saul was greatly stirred by the triumphant death of Stephen. He was shaken in his prejudice; but the opinions and arguments of the priests and rulers finally convinced him that Stephen was a blasphemer; that Jesus Christ whom he preached was an impostor, and that those ministering in holy offices must be right. Being a man of decided mind and strong purpose, he became very bitter in his opposition to Christianity, after having once entirely settled in his mind that the views of the priests and scribes were right. His zeal led him to voluntarily engage in persecuting the believers. He caused holy men to be dragged before the councils, and to be imprisoned or condemned to death without evidence of any offense, save their faith in Jesus. Of a similar character, though in a different direction, was the zeal of James and John, when they would have called down fire from heaven to consume those who slighted and scorned their Master. Saul was about to journey to Damascus upon his own business; but he was determined to accomplish a double purpose, by searching out, as he went, all the believers in Christ. For this purpose he obtained letters from the high priest to read in the synagogues, which authorized him to seize all those who were suspected of being believers in Jesus, and to send them by messengers to Jerusalem, there to be tried and punished. He set out upon his way, full of the strength [p. 22] and vigor of manhood and the fire of a mistaken zeal. As the weary travelers neared Damascus, the eyes of Saul rested with pleasure upon the fertile land, the beautiful gardens, the fruitful orchards, and the cool streams that ran murmuring amid the fresh green shrubbery. It was very refreshing to look upon such a scene after a long, wearisome journey over a desolate waste. While Saul, with his companions, was gazing and admiring, suddenly a light above the brightness of the sun shone round about him, "and he fell to the earth, and heard a voice saying unto him, Saul, Saul, why persecutest thou me? And he said, who art thou, Lord? And the Lord said, I am Jesus whom thou persecutest; it is hard for thee to kick against the pricks." The scene was one of the greatest confusion. The companions of Saul were stricken with terror, and almost blinded by the intensity of the light. They heard the voice, but saw no one, and to them all was unintelligible and mysterious. But Saul, lying prostrate upon the ground, understood the words that were spoken, and saw clearly before him the Son of God. One look upon that glorious Being, imprinted his image forever upon the soul of the stricken Jew. The words struck home to his heart with appalling force. A flood of light poured in upon the darkened chambers of his mind, revealing his ignorance and error. He saw that while imagining himself to be zealously serving God in persecuting the followers of Christ, he had in reality been doing the work of Satan. He saw his folly in resting his faith upon the assurances of the priests and rulers, whose sacred [p. 23] office had given them great influence over his mind, and caused him to believe that the story of the resurrection was an artful fabrication of the disciples of Jesus. Now that Christ was revealed to Saul, the sermon of Stephen was brought forcibly to his mind. Those words which the priests had pronounced blasphemy, now appeared to him as truth. In that time of wonderful illumination, his mind acted with remarkable rapidity. He traced down through prophetic history, and saw that the rejection of Jesus by the Jews, his crucifixion, resurrection, and ascension had been foretold by the prophets, and proved him to be the promised Messiah. He remembered the words of Stephen: "I see the heavens opened, and the Son of man standing on the right hand of God," and he knew that the dying saint had looked upon the kingdom of glory. What a revelation was all this to the persecutor of the believers! Light, clear but terrible, had broken in upon his soul. Christ was revealed to him as having come to earth in fulfillment of his mission, being rejected, abused, condemned, and crucified by those whom he came to save, and as having risen from the dead, and ascended into the heavens. In that terrible moment he remembered that the holy Stephen had been sacrificed by his consent; and that through his instrumentality many worthy saints had met their death by cruel persecution. "And he, trembling and astonished, said, Lord, what wilt thou have me to do? And the Lord said unto him, Arise and go into the city, and it shall be told thee what thou must do." No doubt entered the mind of Saul that this was [p. 24] Jesus of Nazareth who spoke to him, and that he was indeed the long-looked-for Messiah, the Consolation and Redeemer of Israel. And now this Jesus, who had, while teaching upon earth, spoken in parables to his hearers, using familiar objects to illustrate his meaning, likened the work of Saul, in persecuting the followers of Christ, to kicking against the pricks. Those forcible words illustrated the fact that it would be impossible for any man to stay the onward progress of the truth of Christ. It would march on to triumph and victory, while every effort to stay it would result in injury to the opposer. The persecutor, in the end, would suffer a thousand-fold more than those whom he had persecuted. Sooner or later his own heart would condemn him; he would find that he had, indeed, been kicking against the pricks. The Saviour had spoken to Saul through Stephen, whose clear reasoning from the Scriptures could not be controverted. The learned Jew had seen the face of the martyr reflecting the light of Christ's glory, and looking like the face of an angel. He had witnessed his forbearance toward his enemies, and his forgiveness of them. He had further witnessed the fortitude and cheerful resignation of other believers in Jesus while tormented and afflicted, some of whom had yielded up their lives with rejoicing for their faith's sake. All this testimony had appealed loudly to Saul, and thrust conviction upon his mind; but his education and prejudices, his respect for priests and rulers, and his pride of popularity, braced him to rebel against the voice of conscience and the grace of God. He had struggled entire nights [p. 25] against conviction, and had always ended the matter by avowing his belief that Jesus was not the Messiah, that he was an impostor, and that his followers were deluded fanatics. Now Christ had spoken to Saul with his own voice: "Saul, Saul, why persecutest thou me?" And the question, "Who art thou, Lord?" was answered by the same voice, "I am Jesus, whom thou persecutest." Here Christ identifies himself with his suffering people. Saul, in persecuting the followers of Jesus, had struck directly against the Lord of Heaven. Jesus declares that in afflicting his brethren upon earth, Saul had struck against their Head and Representative in Heaven. In falsely accusing and testifying against them, he had falsely accused and testified against the Saviour of the world. Here it is plainly seen that Christ suffers in the person of his saints. How different from what he had anticipated was his entrance into that city! In proud satisfaction he had neared Damascus, expecting on his arrival to be greeted with ostentation and applause because of the honor conferred upon him by the high priest, and the great zeal and [p. 26] penetration he had manifested in searching out the believers, to carry them as captives to Jerusalem, there to be condemned, and punished without mercy. He had determined that his journey should be crowned with success; and his courageous and persevering spirit quailed at no difficulties or dangers in the pursuance of his object. He had determined that no Christian should escape his vigilance; he would inquire of men, women, and children concerning their faith, and that of those with whom they were connected; he would enter houses, with power to seize their inmates, and to send them as prisoners to Jerusalem. But how changed was the scene from that which he had anticipated! Instead of wielding power and receiving honor, he was himself virtually a prisoner, being deprived of sight, and dependent upon the guidance of his companions. Helpless, and tortured by remorse, he felt himself to be under sentence of death, and knew not what further disposition the Lord would make of him. He was taken to the house of the disciple Judas, and there he remained, in solitude, studying upon the strange revelation that had broken up all his plans, and changed the entire current of his life. He passed three days in perfect blindness, occupying that terrible time with reflection, repentance, and earnest prayer, neither eating nor drinking during that entire period. With bitterness he remembered Stephen, and the evidence he had given of being sustained by a power higher than that of earth. He thought with horror of his own guilt in allowing himself to be controlled by the malice and prejudice of [p. 27] the priests and rulers, closing his eyes and ears against the most striking evidence, and relentlessly urging on the persecution of the believers in Christ. He was in lonely seclusion; he had no communication with the church; for they had been warned of the purpose of his journey to Damascus by the believers in Jerusalem; and they believed that he was acting a part the better to carry out his design of persecuting them. He had no desire to appeal to the unconverted Jews; for he knew they would not listen to or heed his statements. He seemed to be utterly shut out from human sympathy; and he reflected, and prayed with a thoroughly broken and repentant spirit. Those three days were like three years to the blind and conscience-smitten Jew. He was no novice in the Scriptures, and in his darkness and solitude he recalled the passages which referred to the Messiah, and traced down the prophecies, with a memory sharpened by the conviction that had taken possession of his mind. He became astonished at his former blindness of understanding, and at the blindness of the Jews in general, in rejecting Jesus as the promised Messiah. All now seemed plain to him, and he knew that it was prejudice and unbelief which had clouded his perceptions, and prevented him from discerning in Jesus of Nazareth the Messiah of prophecy. This wonderful conversion of Saul demonstrates in a startling manner the miraculous power of Christ in convicting the mind and heart of man. Saul had verily believed that to have faith in Jesus was virtually to repudiate the law of God [p. 28] and the service of sacrificial offerings. He had believed that Jesus had himself disregarded the law, and had taught his disciples that it was now of no effect. He believed it to be his duty to strive with his utmost power to exterminate the alarming doctrine that Jesus was the Prince of life; and with conscientious zeal he had become a persevering persecutor of the church of Christ. But Jesus, whose name of all others he most hated and despised, had revealed himself to Saul, for the purpose of arresting him in his mad career, and of making, from this most unpromising subject, an instrument by which to bear the gospel to the Gentiles. Saul was overwhelmed by this revelation, and perceived that in opposing Jesus of Nazareth, he had arrayed himself against the Redeemer of the world. Overcome by a sense of his guilt, he cried out, "Lord, what wilt thou have me to do?" Jesus did not then and there inform him of the work he had assigned him, but sent him for instruction to the very disciples whom he had so bitterly persecuted. The marvelous light that illuminated the darkness of Saul was the work of the Lord; but there was also a work that was to be done for him by the disciples of Christ. The answer to Saul's question is, "Arise, and go into the city, and it shall be told thee what thou must do." Jesus sends the inquiring Jew to his church, to obtain from them a knowledge of his duty. Christ performed the work of revelation and conviction; and now the penitent was in a condition to learn of those whom God had ordained to teach his truth. Thus Jesus gave sanction to the authority of his organized church, and placed [p. 29] Saul in connection with his representatives on earth. The light of heavenly illumination deprived Saul of sight; but Jesus, the great Healer, did not at once restore it. All blessings flow from Christ, but he had now established a church as his representative on earth, and to it belonged the work of directing the repentant sinner in the way of life. The very men whom Saul had purposed to destroy were to be his instructors in the religion he had despised and persecuted. The faith of Saul was severely tested during the three days of fasting and prayer at the house of Judas, in Damascus. He was totally blind, and in utter darkness of mind as to what was required of him. He had been directed to go to Damascus, where it would be told him what he was to do. In his uncertainty and distress he cried earnestly to God. "And there was a certain disciple at Damascus, named Ananias; and to him said the Lord in a vision, Ananias. And he said, Behold, I am here, Lord. And the Lord said unto him, Arise, and go into the street which is called Straight, and inquire in the house of Judas for one called Saul, of Tarsus; for, behold, he prayeth, and hath seen in a vision a man named Ananias coming in, and putting his hand on him, that he might receive his sight." Ananias could hardly credit the words of the angel messenger, for Saul's bitter persecution of the saints at Jerusalem had spread far and near. He presumed to expostulate; said he, "Lord, I have heard by many of this man, how much evil he hath done to thy saints at Jerusalem. And here he hath authority from the chief priests to bind all that call on thy name." But the command to Ananias was imperative: "Go thy [p. 30] way, for he is a chosen vessel unto me, to bear my name before the Gentiles, and kings, and the children of Israel." The disciple, obedient to the direction of the angel, sought out the man who had but recently breathed out threatenings against all who believed in the name of Jesus. 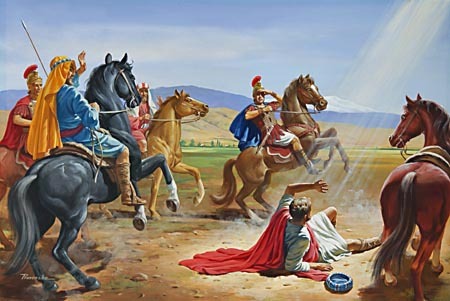 He addressed him: "Brother Saul, the Lord, even Jesus, that appeared unto thee in the way as thou camest, hath sent me, that thou mightest receive thy sight and be filled with the Holy Ghost; and immediately there fell from his eyes as it had been scales, and he received sight forthwith, and arose and was baptized." Christ here gives an example of his manner of working for the salvation of men. He might have done all this work directly for Saul; but this was not in accordance with his plan. His blessings were to come through the agencies which he had ordained. Saul had something to do in confession to those whose destruction he had meditated; and God had a responsible work for the men to do whom he had authorized to act in his stead. Saul becomes a learner of the disciples. In the light of the law he sees himself a sinner. He sees that Jesus, whom in his ignorance he had considered an impostor, is the author and foundation of the religion of God's people from the days of Adam, and the finisher of the faith now so clear to his enlightened vision; the vindicator of the truth and the fulfiller of the prophecies. He had regarded Jesus as making of no effect the law of God; but when his spiritual vision was touched by the finger of God, he learned that Christ was the originator of [p. 31] the entire Jewish system of sacrifices; that he came into the world for the express purpose of vindicating his Father's law; and that in his death the typical law had met its antitype. By the light of the moral law, which he had believed himself to be zealously keeping, Saul saw himself a sinner of sinners. He repented, that is, died to sin, became obedient to the law of God, exercised faith in Jesus Christ as his Saviour, was baptized, and preached Jesus as earnestly and zealously as he had once denounced him. The Redeemer of the world does not sanction experience and exercise in religious matters independent of his organized and acknowledged church. Many have an idea that they are responsible to Christ alone for their light and experience, independent of his recognized followers on earth. But in the history of the conversion of Saul, important principles are given us, which we should ever bear in mind. He was brought directly into the presence of Christ. He was one whom Christ intended for a most important work, one who was to be "a chosen vessel" unto him; yet he did not personally impart to him the lessons of truth. He arrested his course and convicted him; but when asked by him, "What wilt thou have me to do?" the Saviour placed him in connection with his church, and let them direct him what to do. Saul was a learned teacher in Israel; but, while in the midst of his blind error and prejudice, Christ reveals himself to him, and then places him in communication with his church, which is the light of the world. In this case Ananias represents Christ, and also represents Christ's ministers upon earth, who are appointed to act in his stead. In Christ's stead, Ananias touches the eyes of Saul that they may receive sight. In Christ's stead, he places his hands upon him, and, praying in Christ's name, Saul receives the Holy Ghost. All is done in the name and by the authority of Christ; but the church is the channel of communication. Click here to read the next chapter: "Paul Enters Upon His Ministry"